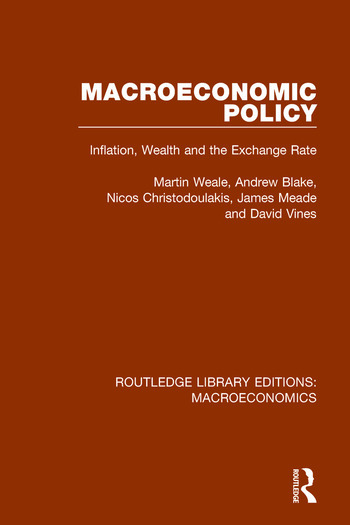 This analysis of macroeconomic policy, originally published in 1989, argues that key government objectives, such as reduced inflation, decreased unemployment and an adequate level of national saving can be achieved only by employing both monetary and fiscal policies, in conjunction with supply-side policies expressly designed to improve the workings of the labour market. Part 1 is a comparative analysis showing the effects of monetary and fiscal policy on the economy. Real-wage rigidity in the labour market is shown to have important consequences for the working of both types of policy, because it conditions the economy’s response to tax changes. Part 2 presents an econometric model which combines consistent stock-flow accounts with a full range of expectational effects. Part 3 presents an innovative technique for solving rational expectations models with the need for arbitary terminal conditions.